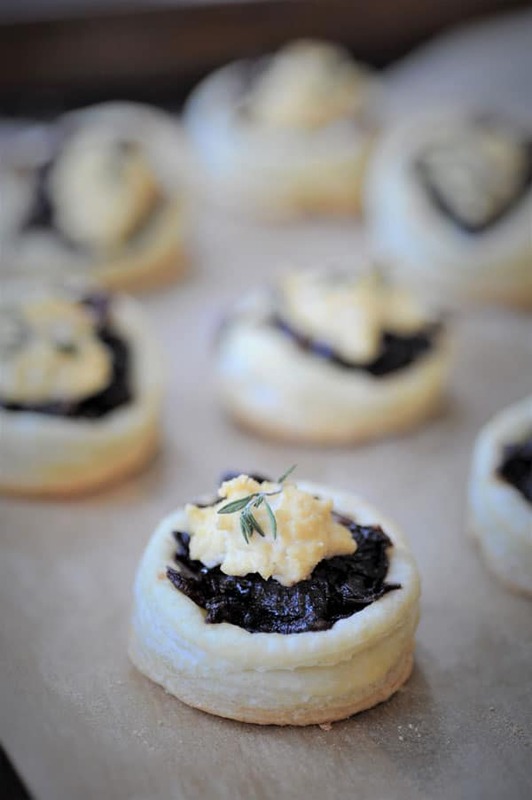 Vegan Onion Confit Tartlets! These elegant and delicious appetizers are a party favorite. Made with onions that are slowly sauteed in rich red wine and vegan ricotta cheese and thyme. They’re as delicious as they are pretty. How do we know that they’re a party favorite? Because I took them to a party last week and my friends raved about them. This delectable recipe is all Alex’s. She brought these pretty little onion tarts to Thanksgiving dinner, and let’s just say that I may have eaten more than my fair share. If you’re hosting a party, going to a party, or you’re staying low key this holiday season, you need to make these. To say that they’re good is an understatement. They’re spectacular, and oh so pretty when you take them out of the oven all puffed up and purple. Purple, you ask? Why yes, the onions are a gorgeous, deep and rich purple color. They’re cooked in red wine for about thirty minutes, and as they soak up the wine they become the most stunning color. And can we also talk about the fragrance that will grace your kitchen when you make these? First, the intoxicating aroma of onions caramelizing in olive oil will make your mouth start watering. 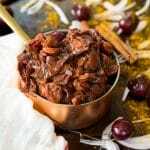 Second, the combination of sugar, wine, and onions swirl together to create a slightly tangy, slightly savory, and slightly heady perfume that’s so inviting. The wine soaked onions are a delicacy all by themselves, and then they’re elevated to one of the best little appetizers you’ll ever eat, because the crispy, almost buttery puff pastry, the creamy ricotta, and the kiss of fresh thyme together are beyond delicious. Just ask my friends. Before we talk about how to make these, there are a few things you should know so you’ll be certain to get the best results. The onions. Use sweet onions only, anything less and you won’t get the same results. The wine. Never, never, never, ever use wine that you wouldn’t drink. Cooking wine is a myth made up by people who don’t like good food. If you want your food to taste as good as it possibly can, then cook with good wine. Also, don’t worry about the alcohol. 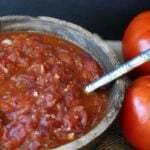 It will evaporate as it cooks and you’ll only be left with a flavorful wine reduction. The puff pastry. Pepperidge Farms’ Puff Pastry is accidentally vegan. If you know of any other vegan brand, let us know. 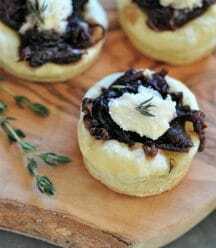 Those are our tips for making the best wine infused onion tarts with ricotta, now let’s make some. First – Caramelize the onion in a bit of olive oil for approximately 20 minutes. 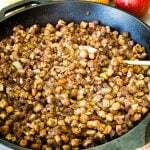 Second – Once the onions are caramelized, add the wine, sugar, and salt and simmer for approximately 25 minutes, or until the wine evaporates and turn the onions into a gorgeous purple color. Third – Use a 2-inch (5 cm) round cookie cutter to cut out circles of pastry dough. 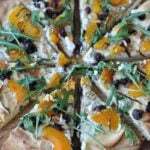 Fill the center with onion, a dollop of vegan ricotta cheese, and a sprig of fresh thyme. Fourth – Bake for about 15 minutes, or until the pastry puffs up and is lightly golden. Make these and let us know what you think. We love to hear from you. 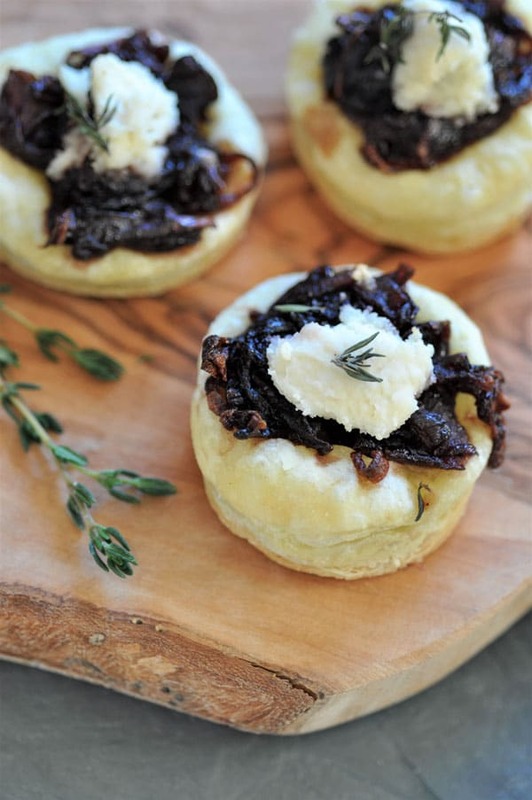 A savory wine infused onion confit nestled in a puff pastry with a dollop of vegan ricotta and fresh thyme. The perfect appetizer for a party. Heat the olive oil in a large skillet on medium heat. When the oil is hot, add the onions and stir to spread out in the pan. Cook for approximately 10 minutes, or until translucent. Stir frequently. Turn the heat down to low and cook for another 15 minutes, or until nicely caramelized. Increase the heat medium ad add the wine, sugar, and salt. Stir well. Cook for approximately 20 to 30 minutes, or until the wine has dissolved and the onions are a deep purple. For the best flavor, allow the onion confit to set overnight in the fridge. Preheat oven to 400°F (204°C) and line a baking sheet with parchment paper. Use a 2-inch (5 cm) round cookie cutter to cut out circles of pastry dough and prick them with a fork about four times. Add a mound of the onion confit to the center of each circle, top with a dollop of the ricotta and sprinkle with a sprig of thyme. Bake for 15 minutes, or until the pastry is puffy and golden brown. Wow, these look almost too pretty to eat and would be a hit at any holiday party. Thanks! These are adorable! Anything vegan and caramelized onion I'm game for! Yum! 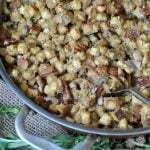 Sounds like a great holiday appetizer! how cute are these??? 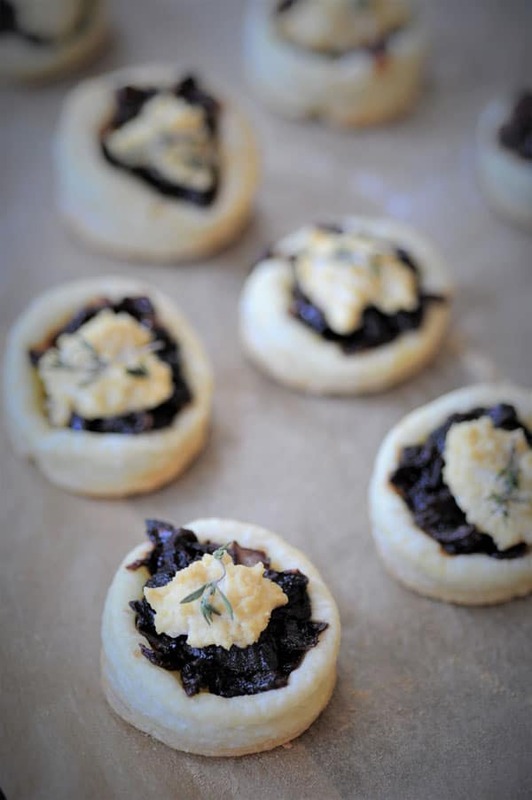 They're perfect for any holiday party...love that you used puff pastry and cut them into circles! These little tarts are so cute! I love how easy it is to make appetizers like this with puff pastry. Perfect little nibbles for the party season! That onion confit makes my mouth water! These look delicious! 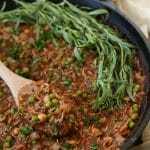 Perfect for any vegan holiday party:) Thanks for sharing! Thank you, Randi! And, you're most welcome. :) Happy holidays! Thank you! Looking to add these to the holiday menu for my daughters who like onions! My pleasure! Let us know what they think. :) Happy holidays! I MUST make these this holiday! Pinning for later. Drooling over here. These sound so delicious!